Running short of worries? Then ponder the super-volcanoes — earth-bombs that can vomit 10 or 100 or 1,000 cubic kilometers of molten rock. Super-volcanoes can change history by creating rivers of red-hot ash moving at highway speed, spreading dust across hundreds of kilometers and spewing vapors that block the sun, destroy crops and start famines. 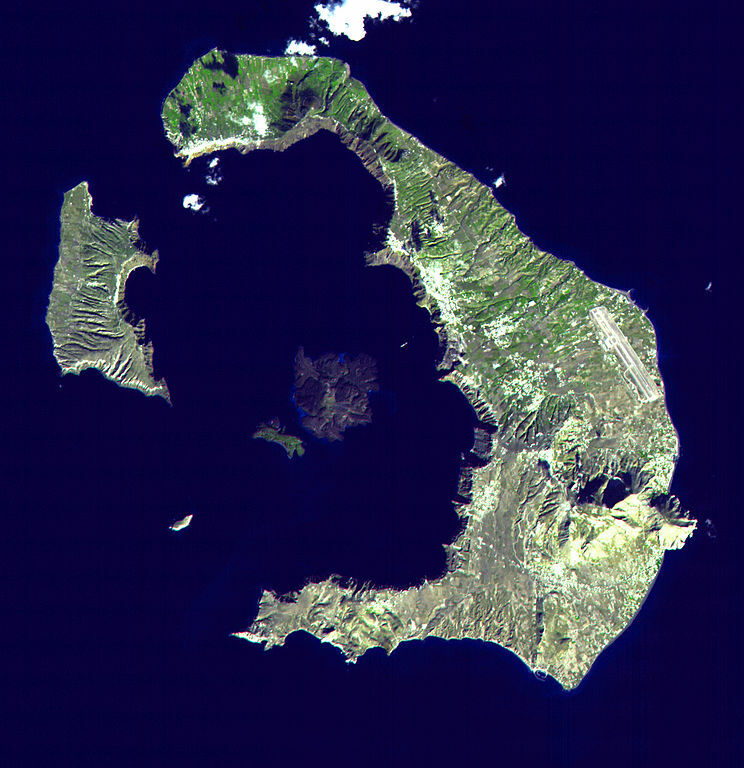 This ring-shaped structure is the caldera at Santorini, in the Mediterranean Sea. In terms of what it threw up, the eruption at Santorini about 3,500 years ago was one of the top four in the past 5,000 years. But this week, Nature published a new analysis of Santorini, a Mediterranean monster, that shows the movement of molten rock that preceded the eruption. Santorini’s sudden release of 40 to 60 cubic kilometers of rock and ash was followed by a giant collapse that left a characteristic ring of hills called a caldera. Thousands may have died in the eruption, which laid down a 60-meter layer of ash and rock. Eruptions of this general size happen about every 300 years, says Timothy Druitt, a volcanologist at the Université Blaise Pascal in France, who lead the current study. The most recent was in 1815 at Tambora, in Indonesia. Druitt’s new analysis of crystals within the frozen magma offers a rough schedule for the entry of molten magma into a holding tank — the magma chamber — below the volcano, which is a precursor to eruption. 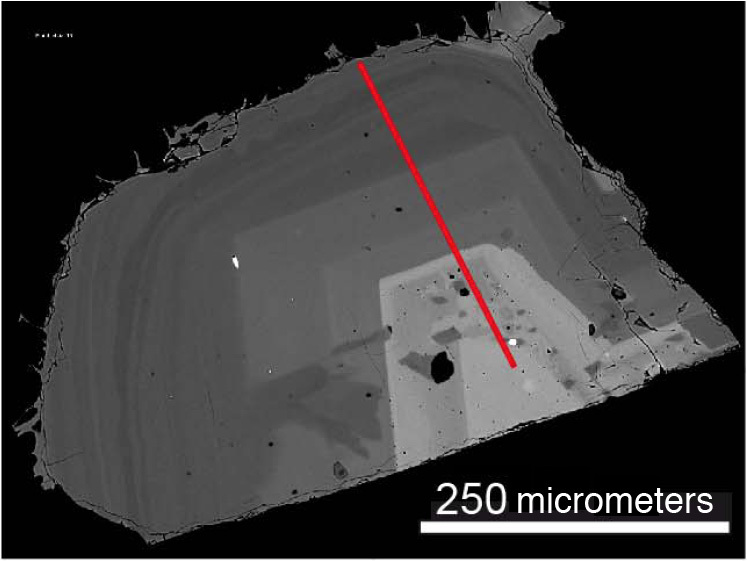 The crystal analysis detects microscopic changes in chemical composition, offering a unique, after-the-fact picture of the gestation of eruption. This mantle of rocky debris was left by the last big eruption at Santorini, about 3,500 years ago. Electron-microscope image of a plagioclase feldspar crystal from Santorini pumice shows the original crystal in light gray, and the growing portions as darker gray. The red line shows where atomic concentrations were measured. The crystals revealed that a big gob of magma — perhaps 10 percent of the magma chamber’s total contents — entered in the decades before the eruption. “Looking at the crystals in this magma, we were able to reconstruct very crudely events taking place in the last few decades prior to the eruption,” Druitt says. That final addition probably made the magma chamber unstable, leading to the eruption, Druitt explains. If such a late, large magma movement proves typical of super-volcanoes, that could contribute to a distant early warning system for mega-eruptions, based on more conventional methods, such as seismic monitoring. The super-volcano at Yellowstone is fed by magma — molten rock — originating deep in the Earth. 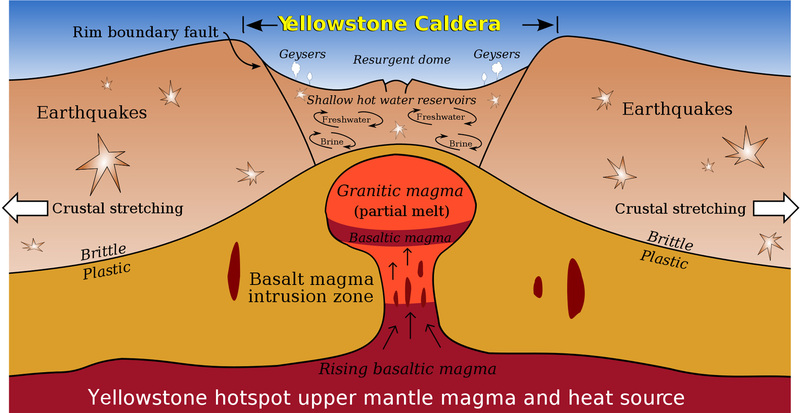 As the magma chamber fills, pressure increases until the volcano explodes. When the rock above the magma chamber collapse, a huge crater results. These calderas only form at large volcanoes. The crystal method gives after-the-fact data on an eruption. Current attempts to anticipate eruptions rely on data about earth shaking, deformation of the crust, and release of gases. “It’s a very timely topic, and solid science in terms of the measurements and observations,” says Bradley Singer, a volcanologist and professor of geoscience at University of Wisconsin-Madison. “They admit that there are issues about the time scales,” largely because the diffusion of strontium and titanium is imperfectly understood in the hot magma. The study’s title, however, specifies that the final growth of the magma chamber occurs on “Decadal to monthly timescales,” Singer notes. “It could be centuries or even longer, which implies that we’d have a longer time prior to the eruption” to worry about the effects of the rising magma. Singer concurs on the importance of understanding the relationship of magma flows, instability and eruption, and says the crystal analysis is gaining traction in volcanology. That’s just as well, since giant caldera-forming volcanoes may be frighteningly common. 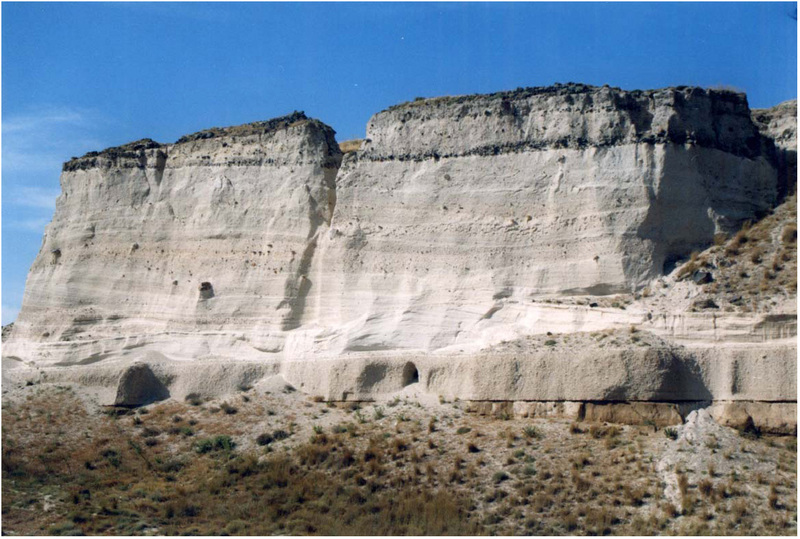 The one at Yellowstone, for example, released 1,000 cubic kilometers of rock 640,000 years ago. Wouldn’t you want to know if something like that was building on your continent?